The California/Nevada state line divides Lake Tahoe in half from north to south. Gambling is legal only in Nevada, which means all Lake Tahoe casinos are in that state, but close enough to the state line that you can stay in one state and gamble in the other. You will find casinos at towns on the Nevada side of the lake in North Lake Tahoe or in the town of Stateline, Nevada at South Lake Tahoe. It would take you 45 minutes to drive from one of those locations to the other, so your choice of casinos at Lake Tahoe depends on where you're staying. South Lake Tahoe is more developed than the north shore. In fact, the casinos are bigger on the south shore and many of them are newer. You'll also find more things to do nearby. You can walk in the main business area for a little shopping and catch the gondola lift to Heavenly Ski Resort in the middle of town, too. Harrah's South Lake Tahoe: Harrah's is one of the best-rated South Tahoe casinos, with 500 hotel rooms, a spa, nightclub, and big-name entertainment. Harvey's Lake Tahoe: One of the oldest Lake Tahoe casinos, Harvey's Lake Tahoe is now owned by Caesars. The complex includes a hotel and casino and several restaurants and small eateries. It hosts a summer outdoor concert series and has a wedding chapel. Hard Rock Hotel and Casino: One of the two best-rated South Tahoe casinos, the Hard Rock Hotel and Casino has plenty of slot machines and table games, as well as a hotel with more than 500 rooms, restaurants, and bars. They also boast the largest outdoor pool experience in South Lake Tahoe. Live entertainment options include a summer concert series. Montbleu Resort Casino: This hotel has more than 400 rooms and suites, and the casino offers all the standard gambling options. The event calendar features concerts that often include famous groups from the 1970s and 80s like Three Dog Night or Foreigner. Their 12th-floor wedding chapel has excellent views of Lake Tahoe. Visitors say it's older but adequate. Lakeside Inn and Casino: This Lake Tahoe casino calls itself "the local's place." Despite what the name implies, they are not on the "lakeside" but a few blocks away. They offer weekly classes to teach the fundamentals of their table games. The hotel is also pet-friendly. These North Lake Tahoe casinos are in the towns of Crystal Bay and Incline Village, Nevada, located along Hwy 28. North Tahoe is more rustic than the south shore and is closer to I-80, Squaw Valley, and Northstar Ski Resort. You'll find fewer shops and restaurants than in South Lake Tahoe, and it's not as pedestrian-friendly. Crystal Bay Club: Find all the standards here, including slot machines and table games. They also have a small hotel with 10 rooms and they often host music events. Hyatt Regency Lake Tahoe Casino: Located in the town of Incline Village, the Hyatt is by far the best-rated casino on the north shore. Besides the casino, there's a 400-plus-room hotel with a spa and a private beach with fire pits. You can plan a wedding here and choose from several beautiful spots to hold the ceremony, including a private beach. Tahoe Biltmore: Located in Crystal Bay, the Biltmore has been around since 1946. Besides the casino and hotel, they have a large ballroom for big events. 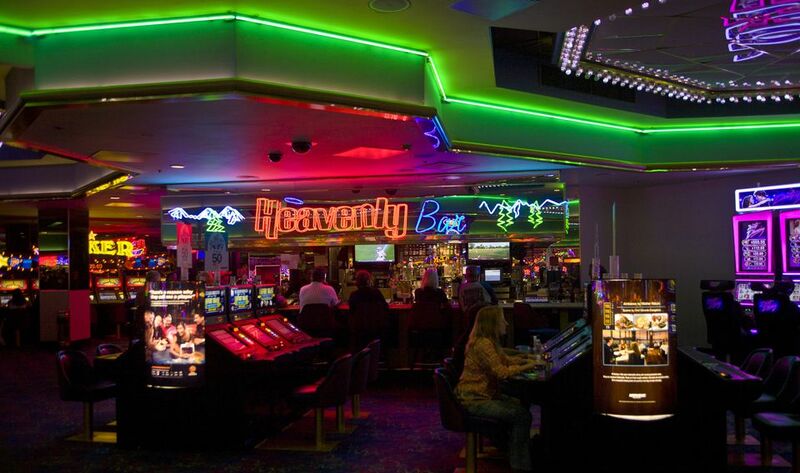 At most Lake Tahoe casinos, you'll find slot machines, poker, blackjack, roulette, craps, and sports betting. All of them also have a player's club, designed to keep you playing in their casino by offering discounts, gaming credits and special offers. You don't have to stay in a casino hotel to experience the casino though (although of course, they want you to). In fact, you may find another, non-gaming hotel nearby offering better value.